When it comes to berries, we usually opt for strawberries, blueberries, raspberries, and blackberries, and we don’t even try to include goji berries in our eating plans. Goji berries might not be as delicious as strawberries, but they are nutritional powerhouses. They are rich in essential vitamins and minerals, as well as powerful antioxidants. Many people believe that goji berries are good for dieters, however I’m going to show you that eating goji berries can help improve your overall health. Below is the list of several health benefits of goji berries. Iron is crucial in maintaining a lot of body functions. Unfortunately, iron deficiency is common among women so it’s important to include iron-rich foods in your eating plan. Many people add leafy greens, especially spinach, to their daily diet, but goji berries contain almost twice as much iron as a cup of spinach. Goji berries are also plentiful in magnesium, calcium, and other essential minerals many people are deficient in. When buying goji berries, look for organic ones to enjoy their health benefits and nutritional value. Goji berries are one of the best anti-aging foods you can eat these days. While they won’t help you live forever, they will definitely help you live a longer and healthier life. Due to their high antioxidant content, goji berries help prevent DNA damage and reduce your risk of chronic diseases such as diabetes, heart disease,arthritis and obesity. Give goji berries a try and you won’t regret it. Goji berries are an excellent source of protein, so if you are trying to boost your protein intake, consider adding these berries to your diet. Goji berries are a complete protein, which means that they help control your appetite and make you feel full longer. This is a good news for people who want to drop weight. 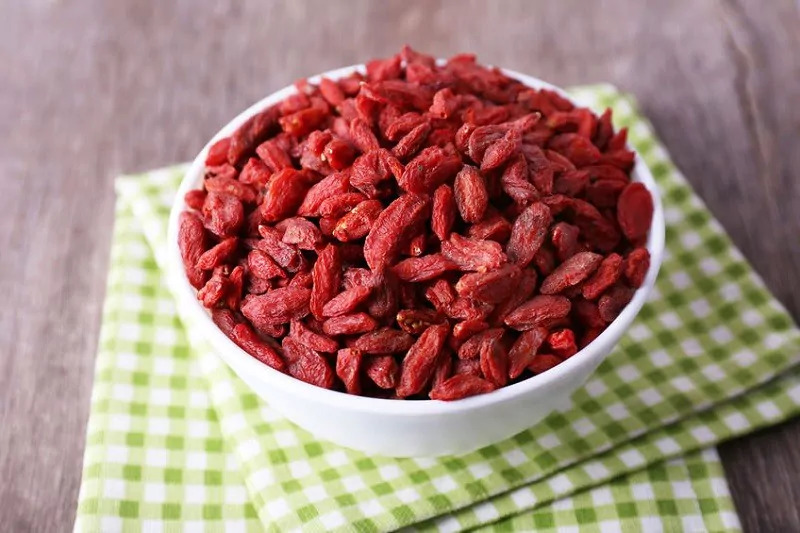 Sure, goji berries are not a protein shake, but consuming them regularly will help boost your protein intake, improve your immune system and cleanse your body. Many people have been obsessed with the idea of detoxing their bodies. Personally I’m not interested in detoxing, though I love green smoothies and juices. But if you want to detox your body, be sure to add goji berries to your diet. Since your liver and kidneys will be working hard to help your body get rid of all the harmful toxins, you will need to consume food that will help those organs work properly. Goji berries are a win-win solution here. Carrots are not the only excellent source of vitamin A. Goji berries are high in beta-carotene too. When we are trying to increase our intake of vitamin A, we usually opt for carrots, bell peppers or sweet potatoes. Add goji berries to this list, and you won’t have to worry about vitamin A deficiency. Just make sure you consume goji berries in moderation since they have some side effects too. Goji berries are good for people who have some digestive issues or who can’t control their hunger. In fact, if you are always hungry, you might have a low intake of fiber. There are many fiber-rich foods you can incorporate into your diet in order to boost your fiber intake. Goji berry is one of them. You can add it to your favorite smoothie, Greek yogurt or your morning oatmeal. You can also use goji berries in you favorite trail mix to add a new twist to it. Finally, if you are trying to drop a few pounds or you just want to stay fit during the holiday season, goji berries can come in handy. As I mentioned above, these little red berries are high in fiber, meaning that you can control your hunger better and lose weight faster. Again, moderation is the key here. Remember, a little bit can go a long way! There are many ways to add goji berries to your diet. You can add them to your morning smoothie, oatmeal, or yogurt. You can also drink goji berry tea every now and then. Do a small research online and you will find plenty of easy and tasty recipes. Have you ever tried goji berries?